Two men strive to be somebody, and nearly take down a nation along the way. Historian and biographer Dallek (Hail to the Chief, 1996, etc.) 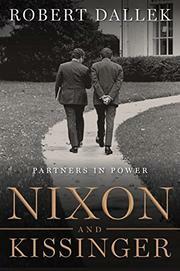 observes that neither Richard Nixon nor Henry Kissinger had much patience with psychoanalysis, but that does not deter him from engaging in a little psychobiography: Both Nixon and Kissinger, who were in essence co-presidents for the last months before Nixon resigned in 1974, were driven, needful men, able to apply themselves to the hardest work and quick to align themselves with those who could advance them. Kissinger, for instance, tried to insinuate himself in the Kennedy administration, but, rebuffed, was happy to find a place in Nixon’s. That place would become central, to mixed result. As Dallek shows, Nixon and Kissinger were odd partners, each despising and fearing the other; years into their partnership, when Kissinger was nearly the only Nixon administration figure to enjoy high standing in the court of public opinion, Nixon complained to aide H.R. Haldeman that Kissinger “is very popular, got good applause, including from our opponents, and a standing and prolonged ovation at the House, but he didn’t make our points.” Much as he may have wanted to, however, Nixon never fired Kissinger, who in turn helped engineer Nixonian triumphs such as the so-called opening of China and the American withdrawal from Vietnam, but who also authored the loss of Vietnam and, though he denied it, the coup in Chile. Working from a trove of recently declassified documents, Dallek capably relates Nixon and Kissinger’s strange relationship, which crumbled after Nixon left office. Along the way, he offers telling notes that a careful reader will link to current events, such as the congressional veto-busting that led to the War Powers Act and Nixon’s last-minute appeal, very late in the game, that America should become energy-independent. In the end, a fine, readable and often disturbing look at power and its infinitely corruptible ways.